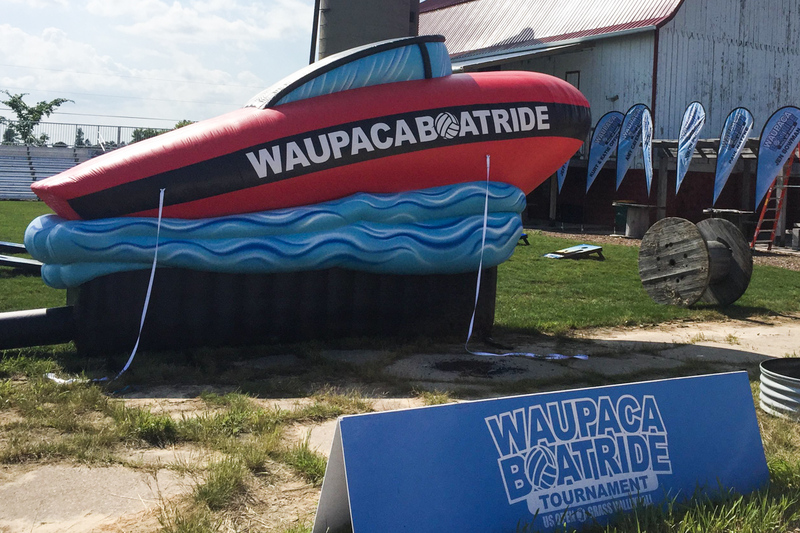 When the Waupaca Boatride Volleyball Tournament started out over 30 years ago, it featured a boat ride after play. Since that time, the mid-July tourney has moved to a larger city (Oshkosh, Wisconsin), where it now includes more than 1,500 teams. Today it is the nation's largest outdoor volleyball tournament. Along the way, however, the annual event has abandoned its once-popular boat ride. But boats are still part of its name and heritage, and tournament director Eddie Zelhofer wanted to keep that tradition alive. So, he asked Landmark Creations to design and build a custom inflatable boat, much like the one that once hosted post-play parties. The result is an impressive red speedboat: 12 feet high, 20 feet long, floating on billowy waves. Authentic in every detail, it even includes realistic "windows." So far, the inflatable replica has made quite a splash, both at the tournament and on social media. "The inflatable was a way to bring a boat back into the mix," says Zelhofer. "By staging it next to our main court complex, it became a powerful marketing and awareness tool." Why did Zelhofer turn to Landmark to put the "boat" back in "Boatride"? "They were easy to deal with throughout the research phase," he says, with "excellent customer service throughout the process."